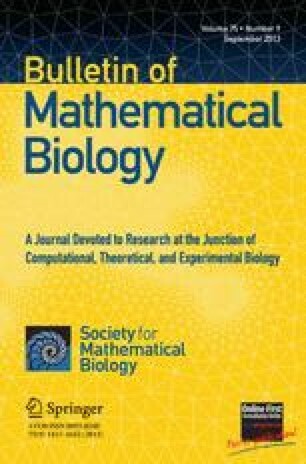 The purpose of this paper is to present a mathematical model for the tumor vascularization theory of tumor growth proposed by Judah Folkman in the early 1970s and subsequently established experimentally by him and his coworkers [Ausprunk, D. H. and J. Folkman (1977) Migration and proliferation of endothelial cells in performed and newly formed blood vessels during tumor angiogenesis, Microvasc Res., 14, 53–65; Brem, S., B. A. Preis, ScD. Langer, B. A. Brem and J. Folkman (1997) Inhibition of neovascularization by an extract derived from vitreous Am. J. Opthalmol., 84, 323–328; Folkman, J. (1976) The vascularization of tumors, Sci. Am., 234, 58–64; Gimbrone, M. A. Jr, R. S. Cotran, S. B. Leapman and J. Folkman (1974) Tumor growth and neovascularization: an experimental model using the rabbit cornea, J. Nat. Cancer Inst., 52, 413–419]. In the simplest version of this model, an avascular tumor secretes a tumor growth factor (TGF) which is transported across an extracellular matrix (ECM) to a neighboring vasculature where it stimulates endothelial cells to produce a protease that acts as a catalyst to degrade the fibronectin of the capillary wall and the ECM. The endothelial cells then move up the TGF gradient back to the tumor, proliferating and forming a new capillary network. In the model presented here, we include two mechanisms for the action of angiostatin. In the first mechanism, substantiated experimentally, the angiostatin acts as a protease inhibitor. A second mechanism for the production of protease inhibitor from angiostatin by endothelial cells is proposed to be of Michaelis-Menten type. Mathematically, this mechanism includes the former as a subcase. One consequence of our numerical simulations is that we obtain very good computational agreement with the time of the onset of vascularization and the rate of capillary tip growth observed in rabbit cornea experiments [Ausprunk, D. H. and J. Folkman (1977) Migration and proliferation of endothelial cells in performed and newly formed blood vessels during tumor angiogenesis, Microvasc Res., 14, 73–65; Brem, S., B. A. Preis, ScD. Langer, B. A. Brem and J. Folkman (1997) Inhibition of neovascularization by an extract derived from vitreous Am. J. Opthalmol., 84, 323–328; Folkman, J. (1976) The vascularization of tumors, Sci. Am., 234, 58–64; Gimbrone, M. A. Jr, R. S. Cotran, S. B. Leapman and J. Folkman (1974) Tumor growth and neovascularization: An experimental model using the rabbit cornea, J. Nat. Cancer Inst., 52, 413–419]. Furthermore, our numerical experiments agree with the observation that the tip of a growing capillary accelerates as it approaches the tumor [Folkman, J. (1976) The vascularization of tumors, Sci. Am., 234, 58–64]. An erratum to this article is available at http://dx.doi.org/10.1006/bulm.2002.0294.